Postcede every gene edit experience with KBioBox's extended GUIDE-Seq analysis to gain vital information to the exact results of the edit. Identify actual cleavage sites, correct and incorrect repairs, observed and potential translocations and the changes to peptide/protein sequences. KBioBox’s extended GUIDE-seq analysis is used to extend standard GUIDE-Seq analysis or any analogous gene edit pipeline. Obtain easier to read reports with additional analyses on nuclease fidelity and other off target activity. Our extended GUIDE-Seq analysis can be adapted to unique edits or situations outside of the standard GUIDE-Seq protocol such as other exogenous genomes and reservoirs. Where did the nuclease cleave in intended and unintended targets, and how frequently. Ensure the accuracy of the nuclease and guide. 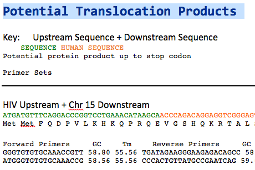 Discover observed translocations, and the potential for other translocations and the resulting changes to peptide sequence. Identify, annotation and visualize all sites affected by the gene edit. Gain information on observed cleavage sites and their frequency. Flag observed and potential translocations, and the effects to peptide sequences.